At the time we were thinking it was a good time to be inside, but once we got home I was glad we were out during the storm. 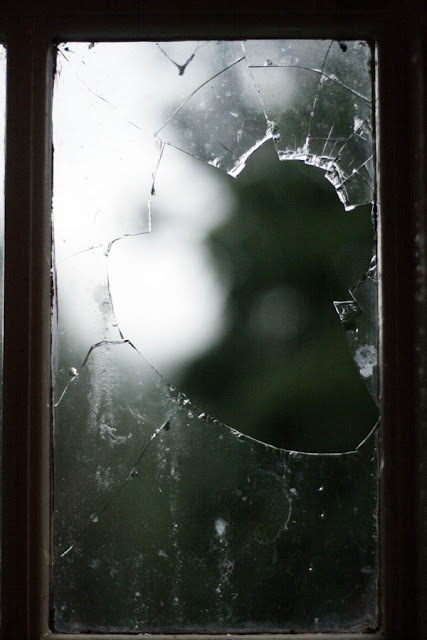 We have four broken windows - two of them broken in two separate panes of glass - and one cracked. 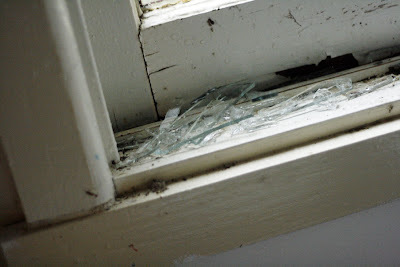 The roof is a bit more dented than before, but as long as it doesn't start leaking I don't really care about that! The kids and I were in the car at Notting Hill waiting for Ben to come out from a computer shop. The hail started first, massive hail stones, and then the rain. 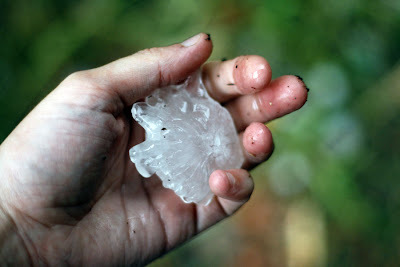 One huge one was, thankfully, soft and broke like a snowball on our windscreen. I moved the car to a carpark as close to the building as possible, in between a 4WD and a big dumpster, pulled a towel across one side of Cedar's seat and then Ash and I sat together in the driver's seat, as the passenger side was being bombarded. Later, as we drove home, there were flooded roads everywhere, twigs and foliage all over the road. One intersection had the black hoods of the traffic lights smashed in pieces all over the ground and the lights weren't working at a few places. Our gravel road was all over the place with a waterfall running down the ditch on the left side. Crazy crazy crazy. Melbourne city had all sorts of chaos, airport closed and evacuations at all sorts of places - Chadstone, the Aquarium, galleries, etc, and some roof cave-ins at Spencer Street station and the Jam Factory at Chapel St. At home we spent a couple of hours cleaning up, our windows are now taped up with bubble wrap! The best thing I had handy, LOL. 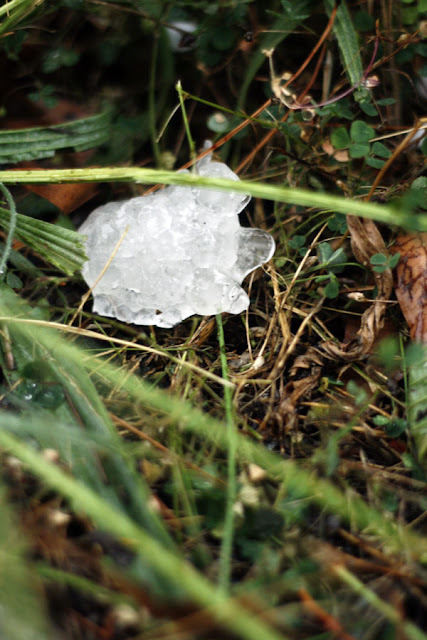 wowww, i have never known hail could be so dangerous! i live in the nw, and all we get is baby hail. it's kind of cute, like dots ice cream. i'm glad you all stayed safe! My goodness! 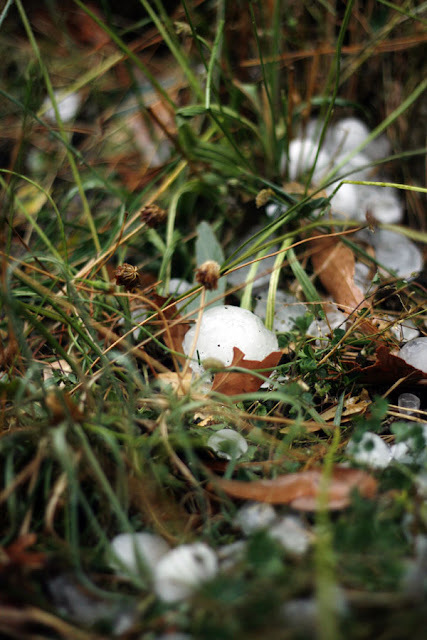 Hail storms can be so scary. My husband and I got caught in one while driving through Kansas. Everyone on the highway was pulled over to the side, and I was terrified that the hail was going to bust our windshield, but we kept driving because we knew we could see the edge of the storm up ahead. We were so relieved when we finally drove out of it! I just saw something about that storm on CNN and had to check on your blog how you guys are doing. Glad nothing much happened to you but sorry about the broken windows. I'm sure you'll find nice stuff to do inside until the weather gets better!